After testing and re-testing various paint systems to find the best, without the need for preparation, we can offer this budget product. Popular with facilities that do not need highly durable solutions, or whose budget is restricted, or more often than not, where the customer is not permitted to prepare the concrete floor in anyway due to leasing conditions and agreements. The term ‘Unprepared’ relates to work done to the concrete prior to applying a paint system. It is not strictly accurate however, since we clean the surface thoroughly. The actual concrete is not altered in any way as it would be if using shot blasting or diamond shaving. Sprayed floor marking is most often used in facilities that store in block stacking configurations where products are placed on the floor in lanes or in zones rather than on racking. Our method of spraying concrete floors is more advanced than the type of floor spray which can be purchased from catalogue suppliers in aerosol cans, due to the paint and machine. 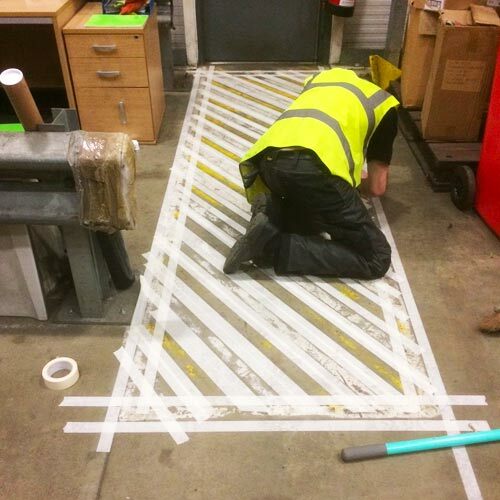 Using specialist machinery and similar paint to that used in our tape and roller option, the spray machine applies floor marking in the fastest way possible. This is very important when access time is restricted. Click on the below data sheet to read more about unprepared at Warehouse Partners. Download the unprepared tape & roller data sheet. Download the unprepared sprayed data sheet.